Online pai gow poker is a casino gambling game that that fuses the game of poker with the Chinese domino game called pai gow. Up to seven players can take part in a game, and it is a world of fun for poker fans, offering them yet another way to enjoy this traditional card game. The majority of casinos will allow you to play for free for as long as you like, so don’t worry about losing money while you are still learning its ins and outs, and you will only need to start betting your hard earned money when you wish to get into line to start winning some! A complete pack of cards is used for online pai gow poker, along with one joker, which stands in as a wild card that can only be used to substitute for an ace, or to complete either a straight, flush or straight flush. The dealer will be playing against the players, and you will be asked to put up a stake before the game begins. During a game of online pai gow poker, each player will receive seven cards, and will have the opportunity to view them and then divide them into two hands. One hand will consist of two cards, the remaining one of five. The value of the five card hand is the same as it would be in traditional poker, with one exception. The A, 2, 3, 4, 5 hand is the second highest type of straight or straight flush hand, and falls between the A, K, Q, J, 10 and K, Q, J, 10, 9 hand. The highest valued hand possible would be that of five aces, possible thanks to the joker wild, beating a straight flush. Any two card pair will beat two unmatched cards, but no other combination is possible for the two card hand. 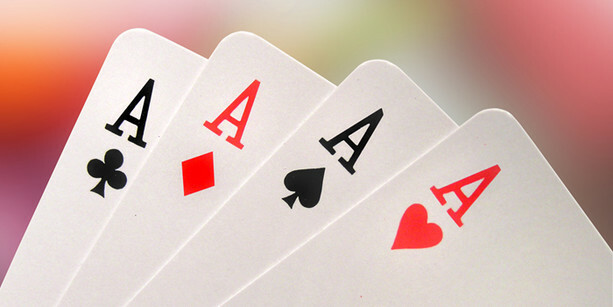 Players need to arrange their cards so that the five card hand is higher than that of the two card hand. Thusly, if you manage to garner two aces in your two card hand, your five card hand would need to contain a pair or better. Online pai gow poker players are not allowed to discuss their hands at any stage of the proceedings. With your two cards facing down, the dealer will expose his or her seven cards. From this point on, you will not be allowed to touch your cards. The dealer’s hand will also be arranged into a five card hand and one containing two cards. The online pai gow poker players’ hands are then revealed and compared. If you win both hands the dealer will pay out the amount you staked, if the dealer wins only one, no money is exchanged, and this is known as a push. If the dealer wins both, you will forfeit your stake, and if the hands are tied the dealer takes the pot. If one hand is tied, a push is once again instituted. Pai Gow is exciting and fast-paced and it’s perfectly suited to adventurous players who love the thrill and suspense that card games have to offer. Online casino hold ‘em is a house game that was designed for dealing by a croupier for players to enjoy in main casinos. In this game your wits will be pitted against the house, and you will not be engaging with any other players. Should the dealer qualify, it is a straight competition between your hand and the dealer’s one and you might even be able to win what is known as an antewin bonus once you place your ante bet. There is sometimes what is known as AA bonus side bets available too, and these are built on the poker value of the player’s two cards and the value of the first three ones dealt on the flop portion of the game. Online casino hold ‘em is not vastly different to other poker variations, and, if you know the basics you will be able to manage your game quite easily. Bear in mind that you will be able to play online casino hold ‘em for free for as long as you like at certain online casinos, by means of the free or demo versions of the game, and, although there is no money to be won when you enjoy the games like this, they are a great way for you to start learning and gain confidence before you invest any of your own hard earned cash in a game. The player makes an ante wager, and two cards are dealt to the player and dealer each. Three community cards are then dealt face up on the table. Now the player will either fold, or call, forfeiting his or her ante bet and cards if the first option is taken. If you call, you will need to bet twice the amount of the ante bet to stay in the game. Two more community cards are then dealt, for a total of five, and the dealer then reveals the two cards he or she has been dealt. The hands will be scored according to the highest poker value of the two cards in each hand and the five cards visible to both players. The dealer will need to be holding a pair of fours or better in order to qualify, if he or she does not then the ante will pay out according to the pay table attached to the online casino hold ‘em game and the call bet will push. Should the dealer qualify and go on to beat the player, the player will lose both the ante and the call, should the dealer qualify and the player wins, the ante will pay according to the pay table and the call bet will pay out to a value of one to one. If the dealer qualifies and the hands are tied then both the ante and call bets will push. A simple online search will yield a host of places for you to enjoy online casino hold ‘em, and you will be in the middle of one of these exciting games quicker than you can say royal flush.